This is my form of an unstructured ode to Paris, one of the best cities in all the land. A city of butter, love, crepes, history, shopping and chocolate. It sounds fabulous, and I assure you, it is. We arrived in Paris late Tuesday night and took the metro right to the Eiffel Tower to see the light show (the Eiffel Tower sparkles every hour on the hour). We emerged from the Trocadero metro station and there it was; all lit up and even more grandiose than it is in movies. I'll admit, I teared up a bit. Look at it. I could look at it all day. I snapped a trillion photos, so you're lucky that I'm only posting one. The next day we did a walking tour of the city that included Notre Dame, the Latin Quarter, the lock bridge, the Louvre and pretty much everything else. The lock bridge, or Pont des Artes as it's actually called, is this bridge that crosses the Siene and goes straight to the Louvre that is covered with padlocks that have couples name's written on them. Just adds to the whole "city of love" vibe. 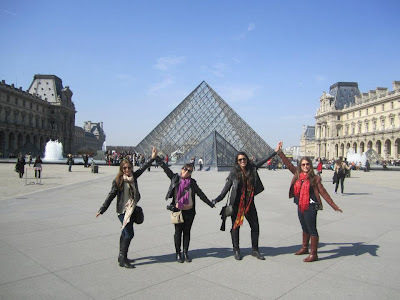 That's us being pyramids in front of the pyramids at the Louvre! I'm lucky to have found friends that are as corny as I am. Our tour guide said that a lot of Parisians don't like the pyramids because they disrupt the elegance of the square. I think they're great - they represent the entire city. Modernity surrounded by history. Sometimes I'm so profound I even shock myself. The next day we took a train to the Palace of Versailles and climbed to the top of the Eiffel Tower. And by climbed I mean we took an elevator (our feet hurt, the line was shorter, and we're generally lazy). You could see out for miles, the city is so much bigger than it seems! Versailles was stunning. We just don't have palaces like that. We also never had a monarchy, so I guess it makes sense. Afterward we made our way on over to the Champs-Elysses and the Arc du Triomphe to shop around and chill out for a bit. It's exhausting being a euro traveler, I gotta tell ya. Now, about the food. I had the highest of high expectations. All semester, I've been reading these pieces in my food writing class about how people go to Paris for the first time, walk into any random bistro, and have the meal of their life. How food in Paris is in a league of its own. Well my friends, it is not. The first night we ate in in the hostel; chicken fingers and nachos. Granted it was pretty late and we were rushing to go see the Eiffel Tower, but still. The next night we were rushing again, ran into some random place by the Sacre Coeur, and had steak frites. It was not good. I think they ran out and bought McDonalds fries and threw them next to a once-frozen slab of unidentified beef. It wasn't until our last day there (that sounds so dramatic we were only there for two days), that I finally had real, delicious Paris food. Everyone and their mother told me to go to Angelina, a world-renowned dessert place located in the heart of Paris. They're famous for their hot chocolate and the above dessert, the Mont Blanc. The restaurant itself is beautiful; very old, Parisian glamour. The desserts, however, are modern. You won't find a chocolate lava tort or a slice of cake or pie. What you will find are meticulously crafted desserts, all with the perfect pairings of flavors and textures. The Mont Blanc was my favorite. It's a meringue cookie piled high with chestnut puree and fresh whipped cream, surrounded by a type of chocolate paste (similar texture to that of marzipan). We also enjoyed a dark chocolate and raspberry tarte, topped with vanilla bean whipped cream, and a gelatinous apple confection that sat atop layers of flaky pastry. And the hot chocolate. The famous Chocolate L'Africain is practically chocolate fondue. They serve it with fresh whipped cream and when the two combine, there are no words. Birthday dinner. Escargot. Les Halles. God I love Paris. Though it was not technically my birthday just yet, I chose to celebrate my twenty-first day of birth with a meal in Paris rather than in Amsterdam (blech I shouldn't have eaten in Amsterdam at all. I'll tell you why in the next post! Aren't teasers fun?). I originally wanted to go to Chez Denise because Anthony Bourdain went there and the New York Times did a review and I want to be a snobby foodie too, but unfortunately we couldn't make a reservation and thus they wouldn't seat us. So we took a leap of faith and crossed the street to Le Louchebem, a classic french steakhouse. It smelled great and the waiters were friendly enough, so we got a table and checked out the menu. Escargot. It had to happen. I couldn't go to France and not eat a snail. So, we ordered 6 and waited patiently. They arrived in a little snail plate, with little snail grabbers and teeny forks to scoop those little buggers out of their shells. Alex, Amy and I scooped out the snails, took one last gulp, and popped them in. Slightly chewy, slightly sweet, covered in garlic-pesto-lemon-butter. Delicious. Who would have thought?! I wanted a whole other serving, they were just that good. Naturally I had to get boeuf bourguignon (beef slow cooked in red wine with veggies and potatoes) because it's featured in Julie and Julia and I had to see what all the hype was about. It was warm, tender and savory and exactly what I wanted. All in all, the good food was good, the not so good food was really not good at all. The food in Rome is a serious contender. And by the end of the 10 days, I was even starting to miss pasta (*gasp*). Well, that's all folks. I'm wiped, and I'm just not ready to tackle Amsterdam yet. I'm still not over it. Welcome to Just Shmying Around! A place to shmy through my latest confectionary creations and adapted recipes. I meant for this blog to be a place to share my love for lots of things; fashion, design, photography, random thoughts... but my baking habits and sugar cravings took over. I hope you're hungry - enjoy!